Almost a year ago I lost my sewing companion and bestest friend of 15 1/2 yrs. 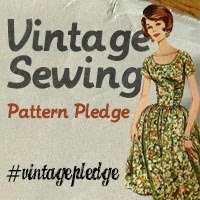 It killed my blogging mojo, not least because so many of my sewing photos starred Madame Hat. Or simply just reminded me of her. It’s been a painful year where my heart is concerned. I’ve missed her terribly. I will for a long long time to come. Her pawprint on my heart and my life was huge. Within a few weeks of losing Hattie another feline took over my life. The vet said this was normal – people who lose a loved pet usually get another one within 3 weeks. Seriously? Yes, apparently. I went to the RSPCA animal shelter about 2 weeks after Hattie died, to simply pat the cats there, to remind myself there were other cats in the world even if my heart was far too sore to contemplate a new feline companion. But you see, we have a rowdy dog who believed cats are Things To Chase (Hattie loved this. An excuse to bash up something!) Any cat that can handle such a dog has to have a certain aplomb … And at the shelter a tiny grey and apricot kitten unceremoniously pushed her bigger brothers away from the food bowl and devoured it all herself. Then she then curled up on my foot and fell asleep. Of course I had to take her home! I picked her up off my foot, snuggled her close and asked if she’d like to come home with me and be my new Sewing Companion. She purred. Was this a yes or no? The shelter worker assured me the kitten’s ambivalence was simply because she didn’t know what a Sewing Companion was, but was confident she’d soon figure it out. I named my new little overlord Ma’at, in the family tradition of giving cats Egyptian names. Her first forays into sewing companionedness was batting bobbins around. Then thread reels. Then unpickers. Then more thread. Then it evolved into playing with all my sewing things – after tossing them all onto the floor. Eventually she got the right idea. Here she is practising being a pattern weight on the thick paper I draft patterns on. She has since successfully graduated to ripping weighing down delicate pattern tissue paper over 40 yrs old. Here she has mastered the art of adorning fabric to enhance it’s beauty. Here her head has fallen off the board while she’s fast asleep, bringing a new twist to the Essential Sewing Companion Skill of sleeping on the ironing board. Miss Ma’at’s chosen chair is the sewing chair. When I want to use it she refuses to relinquish it. She’s also become a rather good ballet dancer, having been taking lessons with me for almost a year now. After Madame Hat’s iron paw, you might think life with such a little cutie is easier. No. She’s a real handful. As my mum put it ‘A little cat with a huge personality’. (She’s never grown very big). She’s a larrikin – a HUGE larrikin in an itty bitty cat-shaped body. She’s so inquisitive and interactive that, combined with the larrikin attitude, she’s always in some misadventure or other. She’s almost a year and a half old now, yet the misadventures still come as thick and fast as they did the day I brought her 3 month old self home. A few birthdays ago a dear friend gave me 6m of red cotton with 1cm white polkadots. 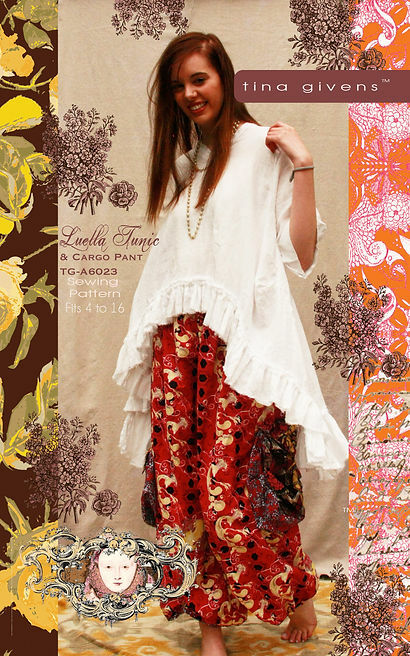 It’s such a classic pattern I can only see it as a flamenco-inspired dress. 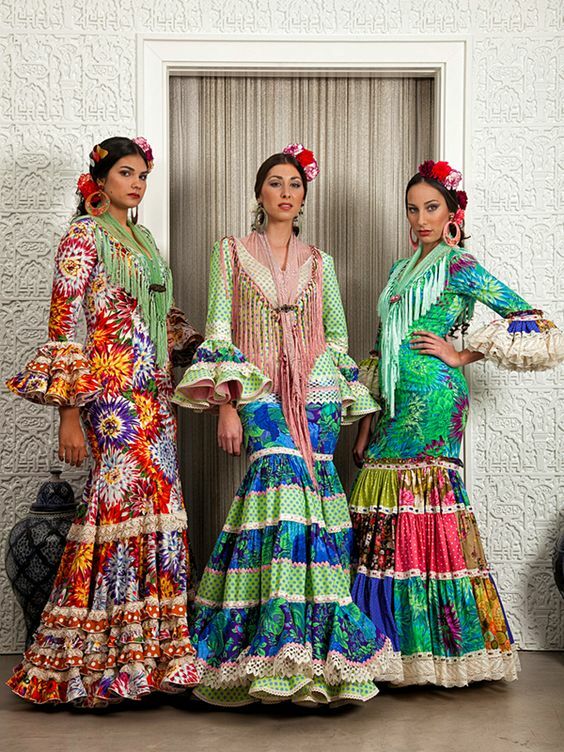 I have another dear friend who lives in Seville, and have been looking through flamenco dress photos with her while I work out exactly what kind of dress I will make. I am posting some pictures here, so I can assess each dress for what I like and don’t like to help me refine my ideas. Well, that’s my excuse anyway. 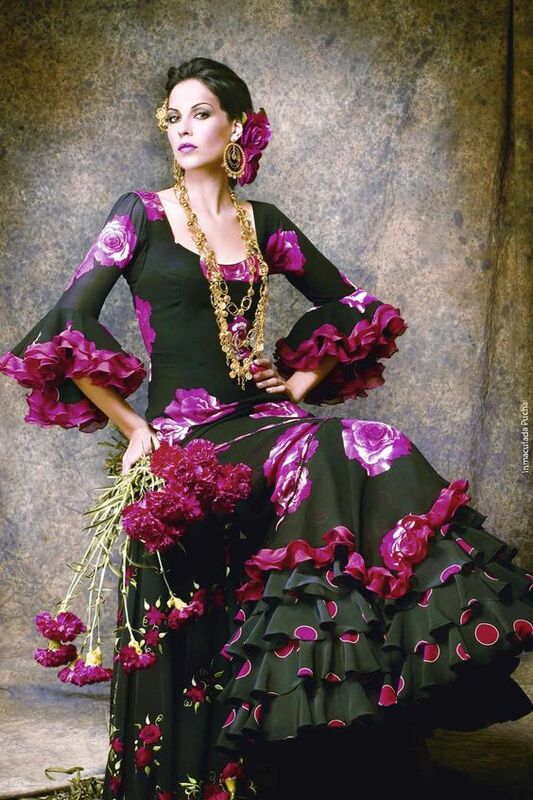 I’m informed by my friend that flamenco fashions change through the years (makes sense really!) and that this is Today’s look. For my own dress I really don’t like that extreme mermaid silhouette, the way the ruffles go remind me of toilet brushes. This beautiful 1940s flamenco dress Vixen Vintage found in an antique store. Vintage Vixen put heaps of petticoats underneath to get the full ruffle effect. Ok so I won’t be making a skirt like this bata de cola. I’m after a party dress, not a performance dress. 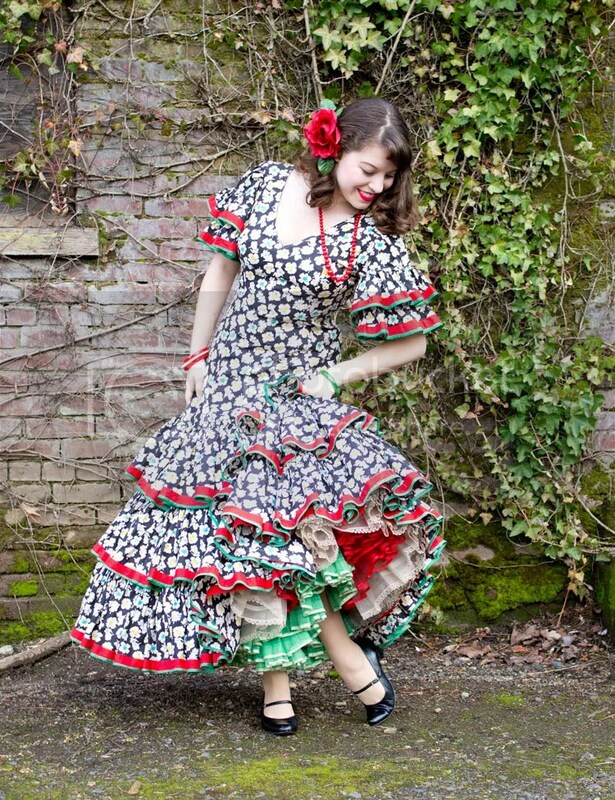 But imagine wearing one like it on stage, dancing flamenco *happy sigh*. 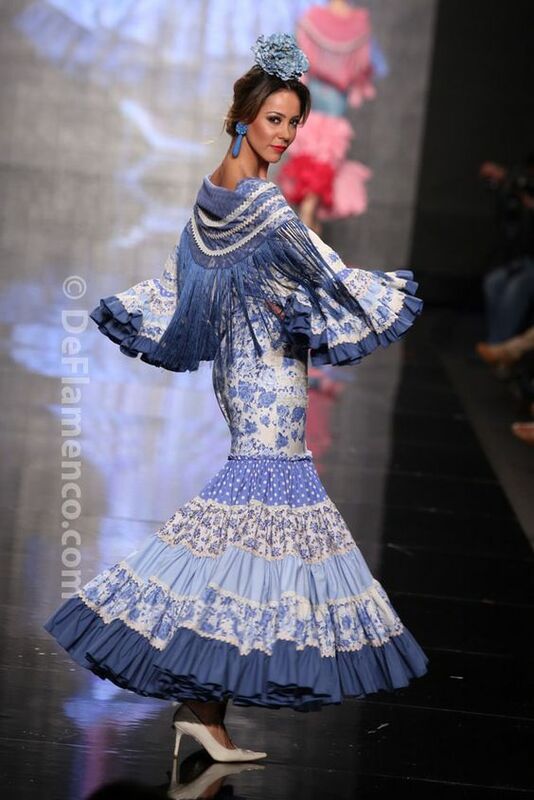 Then there’s all the white wedding Flamenco dresses. Fascinating stuff. I rather like the sleeves on this. I could see a good-quality lace ruffle on my dress perhaps. 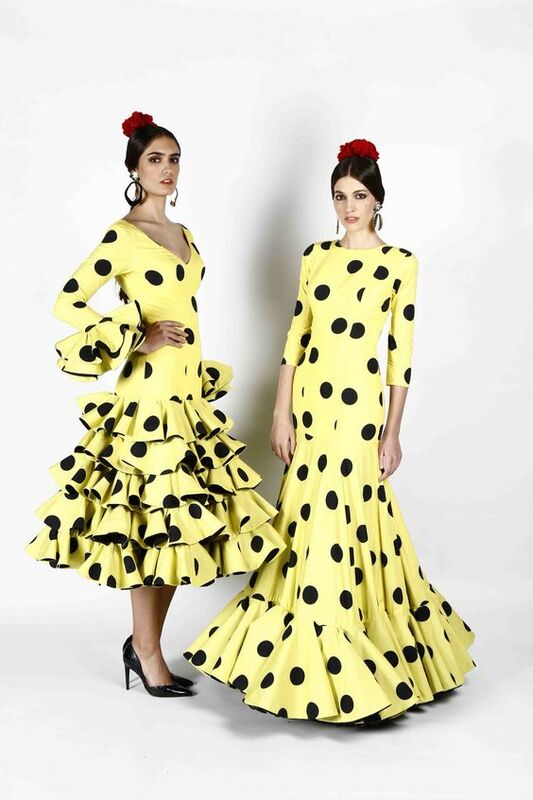 I could totally see myself making a floofy dress based on yet another Tina Givens style in my red polkadots, but my friend explained that although it would be a great dress, it wouldn’t be flamenco-y, which is a more formal style. I was also thinking to ditch the sleeves. 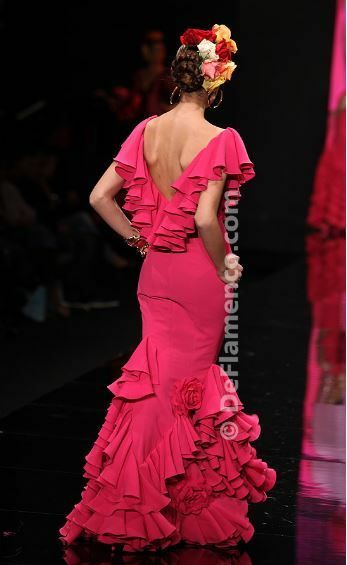 But again, my friend said although there are the odd flamenco dresses with no sleeves, mostly they have them. 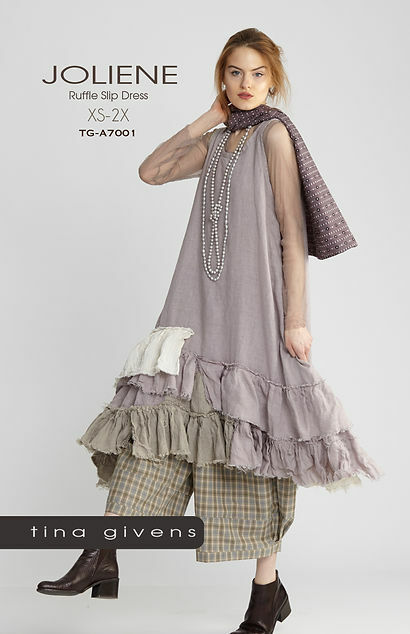 Even if it’s a ruffle around the shoulders and over the arms to give the illusion of sleeves. I’ve noticed a lot of dresses have a scoop or wide v neckline or subtle sweetheart one. Princess seams are also extremely common. 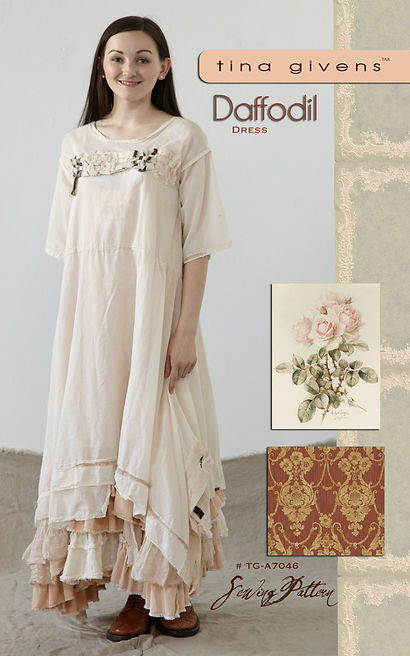 The bones of the dresses seem to be simple and classic. And then there are the shawls! I love the shawls. I’m considering adding one as a kind of collar to my dress, like this – in fact I’m seriously considering making mine pretty much a red version of this dress, I love the style of it (well, and the colour too!) so much. I like this one on the left. It isn’t too toilet-brushy, I like the shape of that skirt. Well, no great conclusions but lots of ideas and eye candy. This is the second Tina Givens look-alike I’ve tried to create. The first one I made I didn’t wear. It just didn’t do it for me for some reason, so I chopped it up into a pair of bloomer-style shorts. The problem was the style – just one of those things you try out and decide it isn’t for you. Then I saw this post found through Sewingpatternreview.com, and I decided it was well worth giving the Tina Givens look-alike thang a second go, especially as the weather was awful. In Darwin ‘awful’ weather means hot and humid and sticky and disgusting. Loose swingy flowing natural-fibre clothes are by far the best clothes for that weather. 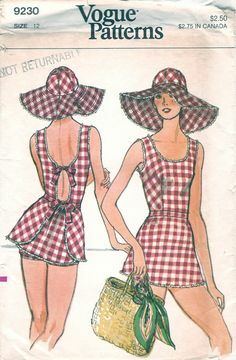 Getting the sort-of-right look in the first dress was so hard I seriously considered just buying the actual Tina Givens Luella Tunic pattern. As well, I’d also recently concluded this dress just wasn’t as I’d really envisioned it, and sent it to the op shop, so I wasn’t feeling that confident with the whole trying to make look-alikes thang. Three points, however, decided me against buying a proper Tina Givens pattern. I’d made the free Tina Givens Plinka Pants pattern for a friend and the draft was so simple and er, essentially shapeless I didn’t want to spend money on a pattern like that. I read this post on Curvy Sewing Collective where the reviewer found the actual pattern so big and shapeless she essentially redrafted the fit using a good-fitting pattern of her own, though not the style, to make it fall more flatteringly. This thread on Artisan Square wasn’t exactly inspiring of spending that much $$$ on any of the patterns either. So I took my favourite shift dress that I know fits well, adjusts easily and usually still looks good after adjustments. I applied it and my copying skills to some gorgeous peacock craft fabric from Spotlight And got cutting and sewing. Here is the result. I cut it to fit within the width and length of the fabric I had chosen to use (2.2m of 112 wide fabric) so I essentially got the pattern out of 2.2m. It looks like the Tina Givens pattern takes a lot more fabric, so hey, I’m happy with mine. I can see there’s a bit of a ‘corner’ in the side seams in the original. I chose to not do that, going with a more streamlined side seam. The overall result is a tunic top I wear so much that the moment it’s been laundered I’m wearing it again. It’s cool, satisfyingly swishy and the fabric is just gorgeous irl. The piccies of the top itself don’t do justice to it so here is a picture of the fabric itself. The neckline is high which helps keep the sun off my crazily fair skin, but as I’ve found with this shift pattern, the neckline isn’t too hot. It’s the perfect compromise between sun-sensible and coolness. Probably one reason why this is my go-to TNT shift dress pattern. 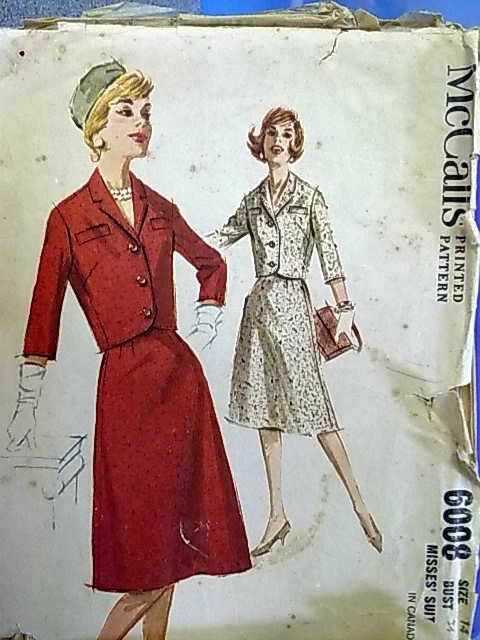 I also made a little cut-on cap sleeve to keep the sun off my shoulders, rather than longer, hotter sleeves as in the Tina Givens pattern. The coral-red in the fabric just so happens to perfectly match the coral butterfly shorts I’m wearing with it in these photos. It looks lovely with the other coloured shorts and 3/4 trousers in my wardrobe too.